Energy efficient homes sound like a dream come true for most of us. Lowering the heating bills every winter and the electrical bills every summer, as well as being environmentally friendly, is what drives us to find and to put into practice energy efficient home plans. Since it might not always be easy, here are some tips and tricks to help you along the way. Also, make sure to check with a designer, architect, or engineer before starting, for more clever ideas and supporting methods of improving your house and bringing it up to standard. 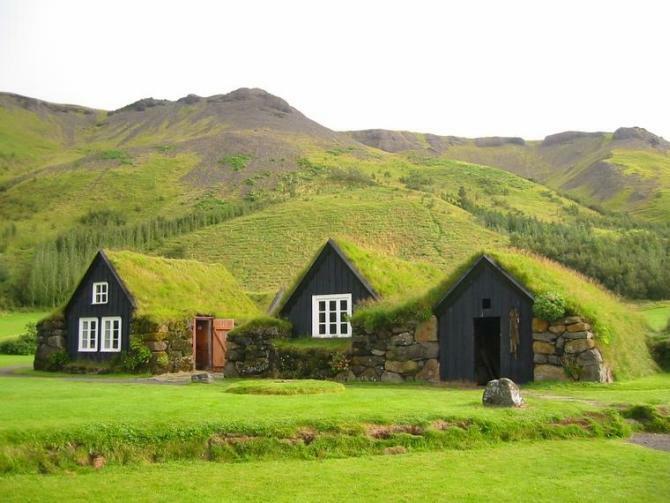 Naturally insulated roof for energy efficient homes. Repair or replace old windows, especially wooden ones, which might be responsible for an unwanted air flow that is disturbing the temperature of the house. Reinsulate the walls of your house every 4 or 5 years because the insulation material wears down over time, gaining holes in it, which make it less efficient. Insulate the garage and attic as well because, if they are cold and draughty, they will affect the rest of the house too and considerably lower the temperature. Use curtains and shades for your windows, which will help insulate them even further. Turn nature into your ally and plant both leafy and evergreen trees around your house, which will naturally protect it against wind and snowstorms. Check to see if there aren’t any holes in the roof through which cold air or super heat in the summer might come in. Paint the roof in pale colors, which will not attract sunlight. If your basement is directly below the house, make sure its ceiling, meaning the floor of the house, doesn’t have any cracks through which the cold might get in. A mistake many people do when building an energy efficient home or improving their existing one is to keep using their old electric appliances right until they break down. They should be replaced with new ones because, given the fact that technology has evolved so much, they use up to 40 percent less energy. Indeed, they do cost more, but this investment will see itself over time, not to mention the fact that it’s a crucial step in making energy efficient homes. You can also use your home appliances less and less as an improvement. A good idea is to differentiate between the situations where you need to use them and the situations you could actually do without. For example, use less of your washing machine when you are at home, and you have time and do the dishes by hand. In the same way, you could use less of your drier in the summer and install an old-fashioned drying line in the yard, to hang your clothes. The same goes for the vacuum, which can, sometimes, be replaced with the classical broom. Think about solutions that will save energy and make you use the appliances less. A good idea is to watch the big resellers, such as depots, which often have appliances like these on very good prices or even on sale. You can also find them in magazines, where they usually present all the cool appliances, both old and new, as well as kits, plans, energy efficient home designs, and checklists to make it easier for you to plan all the big changes. Upgrades to modern manufactured appliances are currently in very high demand. Appliances like the ones we touched on above, which are specifically designed to use less energy, light fixtures, and energy efficient windows, have an Energy Star label on them. For these, you can receive up to $500 from the federal government in credits and grants as they encourage their use. The same goes for skylights, storm doors, home insulation, weather stripping and caulk. They will help insulate your house and make it use as little energy as possible, which the state institutions are backing up. 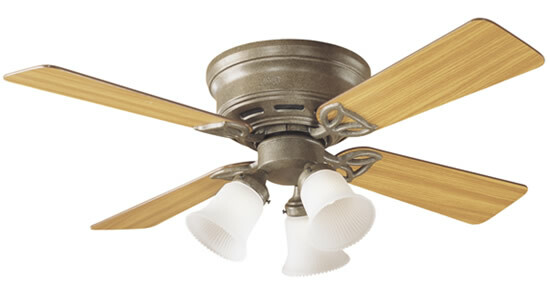 Adding a ceiling fan to one or more of the rooms in your house is a surprisingly simple and efficient measure to lower energy consumption and improve temperature conditions. They are highly economical because they use more or less the same amount of energy as a 100-watt lightbulb. Also, you can use them both in summer and in winter time. During the hot season, make it spin counterclockwise, and then set your thermostat to a few degrees higher. In this way you will save about 40 percent of your electrical bill, like some of the most energy efficient homes are known to. In winter, turn it clockwise and it will save up to 10 per cent of your heating bills. To save as much energy as possible, you need to make sure none of it is used when it’s not needed, mostly when you are not at home. Therefore, you can install a thermostat that will automatically turn down the heaters during the day when the house is unoccupied, or a sensor that will turn off the lights when no one is in the room or actually using them. Position your house’s windows on the south side, so that they can get as much heat and sunlight as possible. Windows on the east, west and north should be minimized, taking into account lighting needs. Usually, they are difficult to handle and aren’t as useful as the ones on south walls. In wintertime, draw back the shades and curtains all day long so that as much sunlight and heat as possible can come through the windows. If you have a fireplace, you can use it as a source of light as well, whenever possible, the same as candles. These include energy efficient modular homes, earth sheltered homes, straw bale, log and manufactured houses, which have all been approved by the authorities as perfectly suitable living arrangements and which are energy efficient and very protective of the environment. Earth-sheltered homes, as the name suggests, are built underground or bermed and are very comfortable and resistant. However, you must keep in mind that they need to be built by an architect or a professional builder, following a pre-approved plan. This is not a DIY project because it can lead to severe damage to both you and the environment, such as collapsing walls or household fires that could spread. Straw bale homes currently enjoy two methods of designing and construction, depending on the load bearing walls and their features. While they seem like a good approach to energy efficient homes, they are still very risky, and this is one topic you need to research and even discuss with a specialist before you begin. You will face many barriers when trying to build an energy efficient bale house, like receiving approval from the local council, fitting it in that particular area, getting loans, mortgages or even insurance for the building or receiving the community’s acceptance for living in the mentioned house. Log homes are the type that uses solid logs as components for both the wall structure and the insulation. Bear in mind that they need a lot of work to be kept up and maintained as systems, as well as making them energy efficient. Also, they too can be dangerous if not handled carefully; this is why you need to get pre-approved before starting to build a log house. This is also what makes it a bit harder to handle than a normal house. Manufactured homes used to be known as mobile, portable or modular homes, because they are built on a permanent chassis. The idea is that they can always be moved according to the owner’s wishes, and they can also be customized as energy efficient homes. They are usually made of prefabricated materials; they are small, energy efficient homes and they are also very affordable. Energy efficiency with these homes can be easily improved and maintained, by caulking, weather stripping, air sealing and choosing the right windows and appliances. When thinking about home energy efficiency you should really consider improving your entire house. Changing the appliances or the windows will help, but treating the entire house as a whole will make the difference. You will save a lot of money, and your house will feel more comfortable and be more durable. Energy will never be free, but you can make it a lot cheaper and affordable through these energy efficient home tips.